Most people are familiar with that bothersome sensation of always needing to sneeze - hay fever. This allergic rhinitis effects millions of people all across the world and can cause interruption to their daily lives, especially when the amount of pollen in the air rises. With new research about pollen counts on the rise, the condition may begin to effect people even more. An informed understanding of the condition and its connection to pollen counts can help coping easier. Allergic rhinitis, or hay fever, describes a group of nasal symptoms that occur in response to an allergen, specifically airborne plant pollen (sometimes called aeroallergens). These triggering pollens vary from place to place and with each individual, but include pollen from grasses, trees and ragweed. These pollens cause an allergic reaction when someone with hay fever breathes them in. The initial symptoms that result can include a runny nose, sneezing, and itchy or watery eyes. After dealing with these issues for a while, later a sore throat, coughing, clogged ears and a headache, among other symptoms, can develop. According to PubMed Health from the US National Library of Medicine, "The best treatment is to avoid what causes your allergic symptoms," though this is not always possible. Antihistamines, nasal corticosteroid sprays, decongestants and nasal washes can help ease the symptoms of allergic rhinitis for some people. 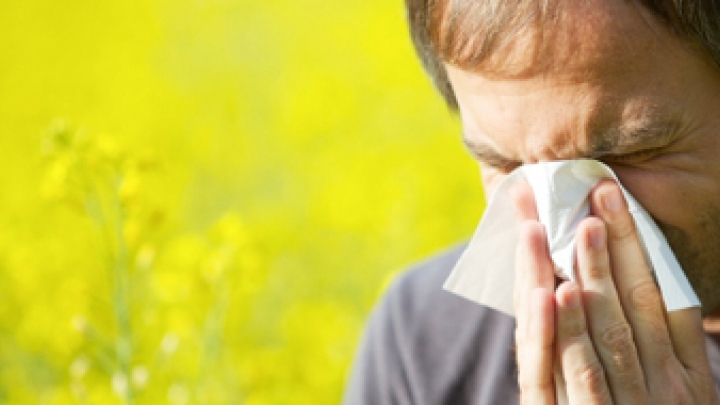 "The amount of pollen in the air can affect whether hay fever symptoms develop," reports PubMed Health. When pollen counts are high, allergic rhinitis patients often try to avoid the outdoors and stay in air conditioned buildings in order to control their uncomfortable symptoms. "The pollen count tells us how many grains of plant pollen were in a certain amount of air (often one cubic meter) during a set period of time (usually 24 hours)," explains the Asthma and Allergy Foundation of America (AAFA). The AAFA warns that pollen counts are analyzed and then reported for a time period that is past, so may not reflect total accuracy to what is currently in the air. However, these reports can be a useful tool for those trying to limit their exposure to these allergens. A study led by Annette Menzel, PhD, from the Technische Universitaet Muenchen (TUM) and published in PLOS ONE Journal in April 2012 found reason to believe that pollen concentration across Europe are rising, and may continue to do so. The researchers analyzed data from 1,221 pollen time series collected at 97 different locations across 13 European countries. The samples were gathered over periods ranging from ten to 28 years. Twenty-three different types of pollen were measured. Menzel's team examined the annual pollen indexes (API) of these spots, a number determined by adding up the average daily pollen counts over a year. In general, counts rose across Europe, but the sharpest increases were seen in urban areas, where pollen counts rose three percent per year on average. Rural areas saw an average rise of one percent per year. Menzel expects these trends to continue and expand, saying, "The conditions we are recording in urban environments today are expected to spread to rural areas in the future." The researchers saw no evidence that rising temperatures were to blame, but did indicate rising levels of carbon dioxide (CO2) as a possible culprit, though further research needs to be done. "More research is needed in this area because a further worldwide increase in atmospheric CO2 is projected...These changes may result in further increases in pollen amounts leading, in turn, to a greater exposure of humans to pollen allergens, with potentially serious consequences for public health," said the authors. According to the American Academy of Allergy Asthma and Immunology (AAAA I), 7.8 percent of US adults have allergic rhinitis. Furthermore, in 2010, 10 percent of American children had dealt with hay fever in the past year. The US Environmental Protection Agency (EPA), estimates that $21 billion dollars is spent in the US each year to treat all these allergies. The EPA contends that further research into pollen concentration is needed in the US, stating that only limited data is currently available, and "long-term data on aeroallergens are needed to document changes in aeroallergen production, and to characterize the distribution, content and potency of airborne allergens." As time passes we are sure to see more detailed research in order to determine if US pollen counts are rising at a rate similar to their European counterparts. If CO2 is indeed contributing to the European rise, this factor will likely be another push for the cause of reducing these greenhouse gasses and living a "greener" lifestyle. With research sure to continue, more will be learned about the methods to treat hay fever symptoms effectively and the exact reasons behind increasing pollen concentrations. PubMed Health, "Allergic rhinitis" Asthma and Allergy Foundation of America, "Pollen and Mold Counts" "Changes to Airborne Pollen Counts across Europe" "Pollen levels are rising across Europe" American Academy of Allergy Asthma and Immunology, "Allergy Statistics" US Environmental Protection Agency, "Allergies Getting Worse?"